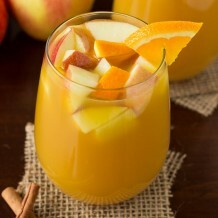 This Holiday Punch is a great way to “cheers” the holiday season with all your family and friends! Ah, the holidays…I seriously love them all. And the best part about them? My top three favorites come right after one another! First Halloween, then Thanksgiving, and last but not least – Christmas. I absolutely love the holiday cheer, the food, the laughter and the abundance of family time that we’re all able to enjoy. 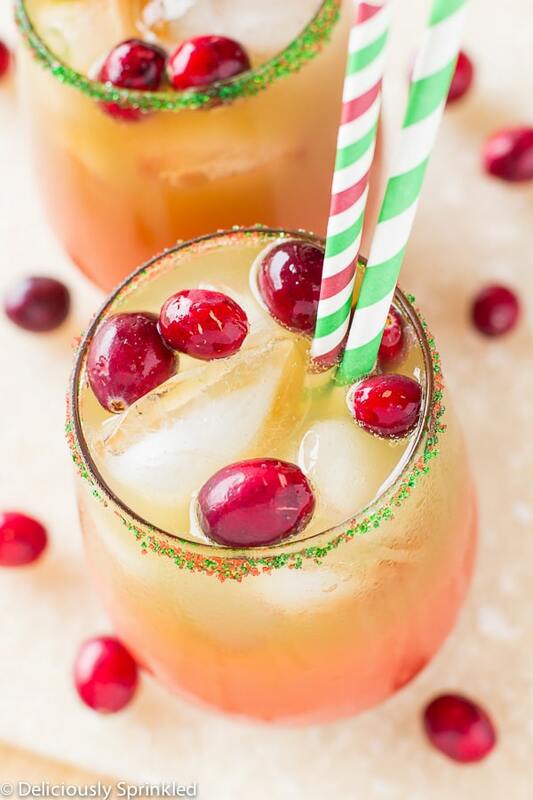 This holiday season, instead of spending your time baking up some treats for the family gatherings, why not give this Holiday punch a try? 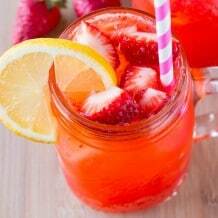 It’s SO good and your family and friends will love how it quenches their thirst perfectly! 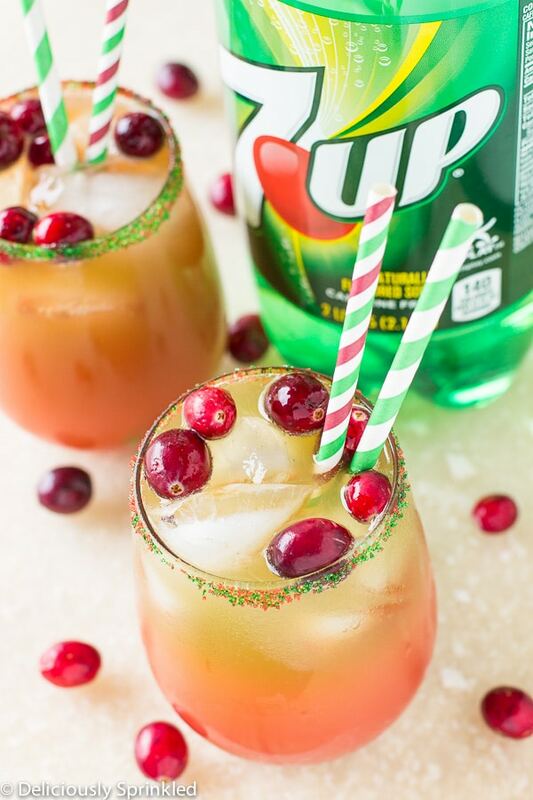 After eating all those sweet treats and delicious side dishes, having a nice, cold refreshing Holiday Punch is exactly what is needed! I love to drink this super cold, so having a ton of ice cubes to my class is an absolute must. 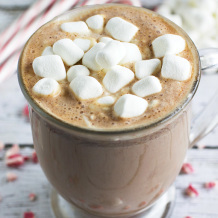 But honestly, however you want to drink it, make certain that you pair it up with a giant helping of holiday cheer! Cheers to you my friends! May your holiday season be full of peace, love, happiness, and of course…some amazing food and drinks! ● FROZEN ORANGE CONCENTRATE: 1 (12 oz.) can of frozen orange concentrate. ● FROZEN LIMEADE CONCENTRATE: 1 (12 oz.) can of frozen limeade concentrate. 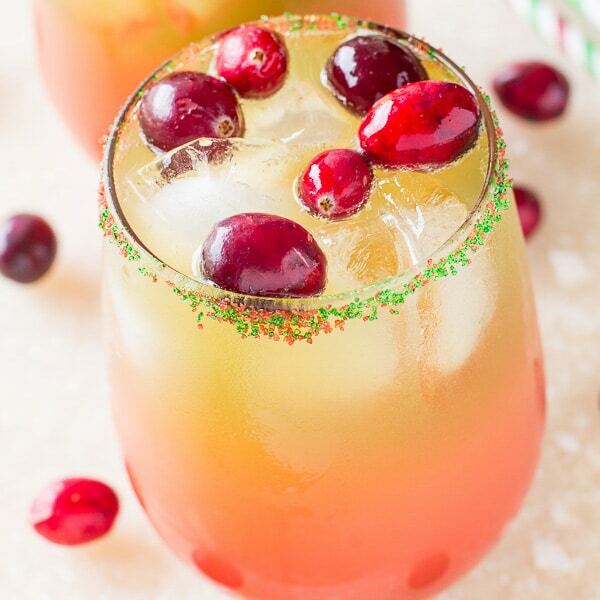 ● CRANBERRY JUICE COCKTAIL: 4 cups of cranberry juice cocktail. ● 7UP SODA: 1 (2 Liters) of 7UP or ginger ale soda. ● VODKA: 12 ounces of vodka or skip the vodka all together! ● SPRINKLES: sugar sprinkles to rim glass. 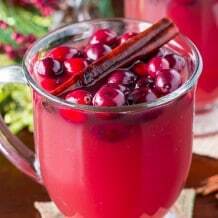 ● CRANBERRIES: cranberries to garnish. STEP 1: In a large bowl, over ice combine all of the liquid ingredients. STEP 2: Top with cranberries, for garnish and serve. USE FROZEN CONCENTRATE: I like to use frozen orange juice concentrate and limeade concentrate for this punch because it helps keep the punch colder. 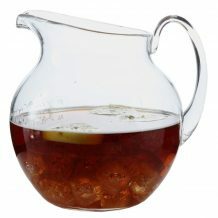 But if you want, you could use regular orange and limeade, just make sure to add LOTS of ice cubes to the punch bowl. DECORATE YOUR GLASS: To rim your class, start with a bowl of water then dip in the rim of your glass. Next, you want to evenly dip the rim into a small bowl of sugar SPRINKLES! NON-ALCOHOLIC: Skip the booze, no problem. 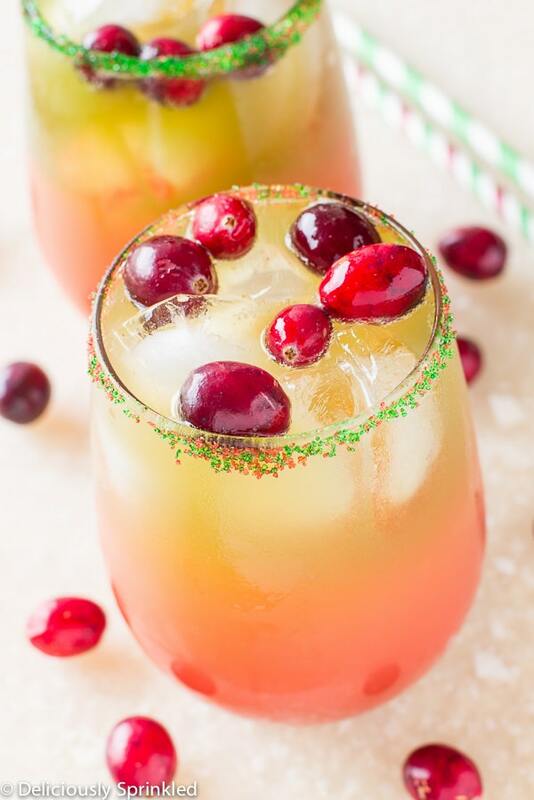 This holiday punch tastes great without the vodka. In a large bowl, over ice combine all of the liquid ingredients. Top with cranberries, for garnish and serve. To rim your class, start with a bowl of water then dip in the rim of your glass. Next, you want to evenly dip the rim into a small bowl of sugar sprinkles! 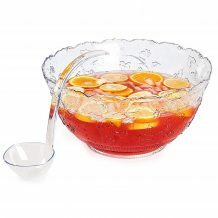 This is the perfect party punch, It would be perfect for Christmas or even New Years. What a great idea for a holiday party! So fun and festive especially with the colored rimmed glasses! 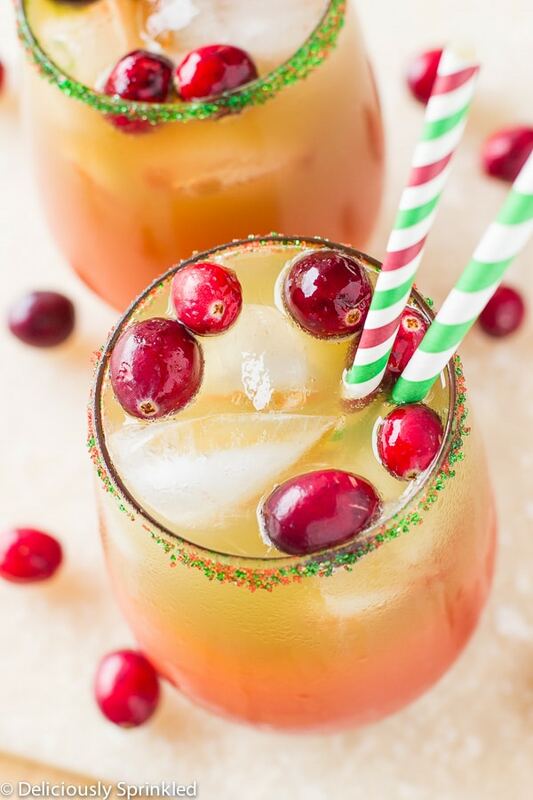 I am saving this holiday punch for my upcoming party! It is literally exactly what I was looking for! 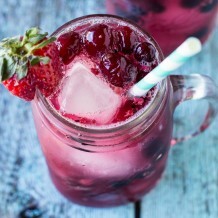 What a gorgeous and delicious party punch! I love how festive the sugars around the rim makes the cups!!! I made this drink for the holidays and it was fantastic. The frozen concentrate helped keep it cold. It would be great for summertime too! I liked the combo of orange juice and lime. Thanks! Just made this.. literally… and it is DELICIOUS!!!! I am adding vodka with each individual drink so the kids can have some, and EVERYONE loves it!!! I will be making this again for SURE!! Do you add water to the concentrate? Do you make the frozen concentrate juice as per directions with the water or skip the water entirely and just use the frozen concentrate? I made this. It was a hit. I did mine a Lil different. Instead of Cranberry juice I boiled some cranberries with sugar and froze the cranberries in their juice. I scoped the frozen cranberries out of the bowel and into the pineapple juice. To make this an adult drink. Instead of adding soda I added 1 bottle of sparkling Moscato and pineapple rum by Parrot Bay. I also added crushed pineapple. Everyone loved it.